The highly anticipated ‘O Munaciello is slated to open its doors early 2017 at 6425 Biscayne Blvd., in the heart of the MiMo District in Miami, FL. Recreating and interpreting traditional Neapolitan dishes, ‘O Munaciello is a full-menu restaurant and pizzeria that is considered one of the most celebrated restaurants in Florence, Italy. ‘O Munaciello uses local produce and fine imported goods to create dishes found nowhere else in the South Florida region. 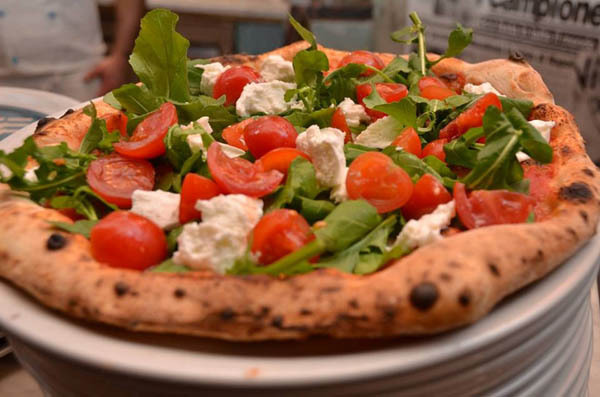 Its pizzas are even baked in a made-to-measure handmade brick oven, imported from Naples, Italy. ‘O Munaciello Miami will be open six days a week serving reasonably priced dishes that range from succulent appetizers to decadent desserts. The Campania region is celebrated for the excellence of its tomatoes, the freshness of its fish and seafood, and buffalo mozzarella cheese. The inventive Miami menu will mirror the Florence restaurant’s menu every season, consisting of signature dishes showcasing Neapolitan flair, including Agnolotti, homemade meat ravioli on creamy potatoes and smoked Buffalo cheese and Seafood Scialatiello, a pasta platter for two, with clams, mussels, shrimps, calamari and Piennolo cherry tomatoes, to name a few. Expect several specialty pizzas from the brick oven with an innovative twist such as Tonno (fresh tuna, mozzarella, cherry tomatoes), Ricotta E Salamino Piccante (ricotta cheese, spicy salami, mozzarella and tomato sauce), Cornicione Di Ricotta (tomato sauce, mozzarella, ricotta cheese- stuffed crust), and Melanzane E Salsiccia (eggplant and sausage). Also included in the menu are several different types of calzones and focaccia. In keeping with its mission to honor the Neapolitan heritage, ‘O Munaciello will top off the dinner menu with delicious Italian desserts, including Pastiera, a traditional cake from Naples with Ricotta cheese, Rum Baba, a trio of rum cakes soaked in rum syrup and Caprese, a chocolate soufflé with a warm fondant center, served with pistachio ice cream. As soon as guests enter ‘O Munaciello Miami, they will be greeted by a handcrafted life-sized statue imported from Naples, Italy of the “‘O Scartellat,” meaning a hunchback. According to Neapolitan lore, touching or rubbing the back of the statue brings good luck. Similarly, looking over diners from the ceiling vaults of the main room will be a life-sized sculpture of “O’Angelo”, the Angel of the Nativity. Also created in Naples out of porcelain and papier mâché, it is an important reflection of the traditions and beliefs of the region. As guests will take their seats at ‘O Munaciello, they will be enveloped in authentically Italian sounds, smells and sights, feeling like they are dining at an authentic restaurant in Naples, Italy. Printed on the tablecloths will be “La Smorfia”, The Book of Numbers, a colorful chart which assigns numerical values for dream symbols. La Smorfia, which has drawings of everyday objects in life, like a bird, hat, knife, coffee grinder and even a mother with child, has defined lucky numbers for generations of Neapolitan. “I wanted to bring the genuine culture and customs of Naples to Miami with La Smorfia, so that guests can play and interpret their dreams while dining, just like in our Florence restaurant,” explains Borgogni. The lighting and decor at ‘O Munaciello has been carefully selected to create a memorable dining experience for all. The art of Neapolitan porcelain/terracotta is best known by the works of the artisanal craftsmen of Sciu Scià e Maestri Ferrigno. The materials have been the same for 150 years – terracotta, wood and the famous silks of San Leucio in Caserta. Depicting the people and daily life in Naples in the 1800s, the small figures and scenes of the pieces at ‘O Munaciello Miami are original and were uniquely made for the restaurant. The works of Sciu Scià e Maestri Ferrigno are exhibited in Paris, New York, Arles, Malmoe and Stuttgart and have won the “Premio San Gregorio Armeno” Award and “The First Award Europe” for their craft. At the helm of ‘O Munaciello Miami’s kitchen is Pizza Master Carmine Candito, who comes from a long line of Neapolitan restaurateurs and pizza makers. He grew up working at his father’s popular restaurant “Un Posto Al Sole” in Naples, Italy, eventually becoming a pizza maker for two leading restaurants in the region. Candito later moved to Florence, Italy, to work at Le Scuderie which was then transformed into ‘O Munaciello over 10 years ago. ‘O Munaciello Florence was built in an annex of the 17th century Florentine Santo Spirito Basilica, one of the most famous and historic churches in Florence, designed by the Renaissance genius, Brunelleschi, who also designed the iconic dome of the city’s main cathedral, the Duomo. The Florence restaurant is located in what used to be the Santo Spirito Basilica’s “pilgrims’ hostel” used to accommodate travelers and the faithful. Elia Cui serves as Executive Chef for the Miami ‘O Munaciello. Originally from the Genoa region of Italy, Cui has experience working in some of the most popular dining venues across Italy, including Porto Cervo (Billionaire), Milan (Byblos), Florence (Pizzeria ZeroZero, Ristorante IX) and Pisa (Villa Lena) before working at ‘O Munaciello Florence. ‘O Munaciello Miami will be a unique addition to the Miami culinary scene. It will maintain the authenticity and traditions of Neapolitan cuisine, but also introduce some dishes with a fresh approach, served only at ‘O Munaciello Miami and its original location in Florence, Italy. The restaurant is slated for opening early 2017. Valet parking will be available at a reduced price for customers. ‘O Munaciello Miami is designed to take guests on a unique culinary journey exploring the multi-dimensional flavors of Naples. From the ambiance, service and wine list, to the menu and décor, ‘O Munaciello invites both local residents and seasonal visitors of Miami alike to experience the unique cultural experience and outstanding cuisine at this approachable everyday neighborhood eatery. For more information on the concept, please visit: munaciello-miami.com.